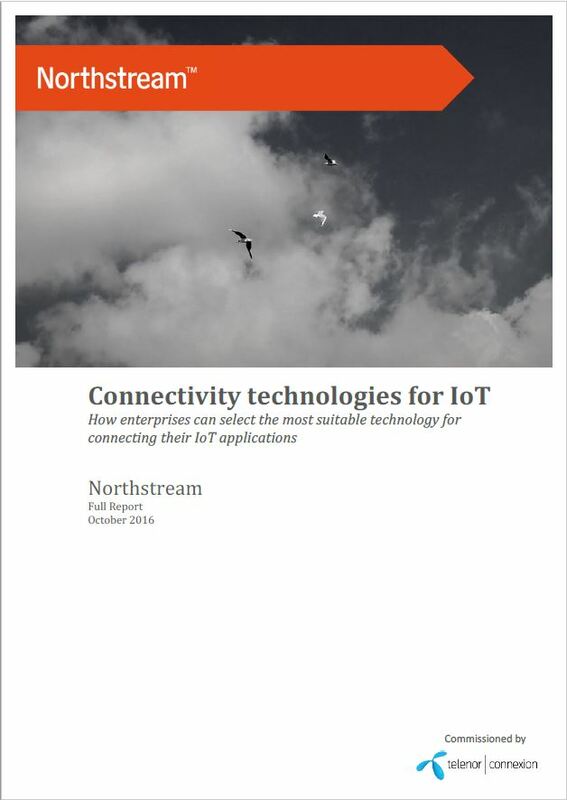 New report from Northstream: Connectivity technologies for IoT - How enterprises can select the most suitable technology for connecting their IoT applications. Telenor Connexion, a leading provider of IoT solutions, today issued the report ‘Connectivity Technologies for IoT’, produced by Northstream, one of Sweden’s leading independent technology consulting firms. Selecting the most suitable connectivity technology is one of the most critical decisions when a company develops an IoT solution. Making the right decision is crucial since the wrong choice can result in poor performance or higher costs in the short term. In the long term, the consequences can include reduced scalability and, at worst, an expensive swap to a more future proof solution. Today there are a variety of technologies for IoT networks, such as traditional cellular (2G/3G/4G), Low Power Wide Area Networks (LPWA), Wi-Fi and Bluetooth. LPWA, in particular, has recently emerged as an alternative for things that were previously too expensive, remote or battery draining to be connected. “Telenor Connexion sees great potential in LPWA, which enables new use cases beyond the cellular-based applications that we deliver today,” said Martin Whitlock, CTO at Telenor Connexion. “We have particularly high expectations on the LPWA standard Narrow-Band IoT, which we believe will be a technology that operators worldwide will establish, thereby ensuring high demands on performance and future proofing. The scale advantages from a widespread usage of NB-IoT cater for an ecosystem where the costs for connected devices can be kept down. Telenor, together with Q-Free will be first in Norway to use NB-IoT on a larger scale as the companies will launch a pilot in January 2017, for smart parking in Trondheim, Norway. The pilot is considered as the first step towards a full-scale commercial network for IoT in Norway. Every company has different needs that require various technical considerations, such as coverage, energy efficiency, security, scalability, and interoperability. These factors determine the choice of IoT technology. The report identifies and groups these considerations into three categories: technical, commercial and ecosystem related, providing companies a structured approach to analyzing their requirements. A 3-page summary of the report can be downloaded here.